Feb. 13, 2015 + + + Partners Statoil ASA, Lundin Petroleum AB, Petoro, Det Norske Oljeselskap ASA, and Maersk Oil have submitted a plan for development and operation (PDO) for Phase 1 of Johan Sverdrup field to the Norwegian Ministry of Petroleum and Energy. The oil field—which lies on the Utsira High in the North Sea, 155 km west of Stavanger—will be developed in several phases. Phase 1 consists of four bridge-linked platforms and three subsea water injection templates, with a production capacity of 315,000-380,000 boe/d (OGJ Online, Feb. 13, 2014). Production from Phase 1 is expected to launch in late 2019. The partners are targeting a recovery rate of 70% (OGJ Online, May 7, 2014). Expected recoverable resources are projected between 1.4–2.4 billion boe. In addition to the PDO, the partners will also submit two plans for installation and operation (PIO) for pipeline transportation and development of power from shore. Oil from the field will be piped to the Mongstad terminal in Hordaland. Capital expenditure for Phase 1 is estimated at 117 billion kroner, which includes offshore facilities, oil and gas export pipelines, development wells, and power supply from shore. Twenty-two appraisal wells drilled on Johan Sverdrup have shown that the reservoir is of “exceptional quality” and multiple production tests also indicate well productivity will be “very high,” partner Lundin says (OGJ Online, Mar. 28, 2014). As a result, Lundin expects “very short” periods from ramp-up to plateau production for Phase 1 and subsequent phases. Phase 2 is expected to start production in 2022. Capex for full field-development is estimated at 170-220 billion kroner as of 2015, with recoverable resources between 1.7-3 billion boe—95% of which is oil—and an expected plateau production of 550,000-650,000 b/d. The partnership previously recommended Statoil as the operator for all phases of the field development and operation (OGJ Online, Dec. 1, 2014). The majority of the partnership has asked the Ministry of Petroleum and Energy to determine the final allocation of resources in Johan Sverdrup, proposing Statoil 40.0267%, Lundin Petroleum subsidiary Lundin Norway AS 22.12%, Petoro 17.84%, Det norske oljeselskap 11.8933%, and Maersk Oil 8.12%. Overall, the field will provide 25% of Norwegian production by 2025, out-producing the entire UK sector. Feb. 24, 2015 + + + Statoil ASA has let an 8-billion-kroner contract to Aibel AS for engineering work, procurement, and construction of the deck for the Johan Sverdrup drilling platform. The deck will comprise three modules. Aibel will build the largest module, the main support frame, at the company’s yard in Thailand. The drilling support module, the second largest, will be built at the company’s yard in Haugesund. The final module, the drilling equipment set, will be built by partner Nymo in Grimstad. Work on combining the three modules will start in fall 2017 at Haugesund. 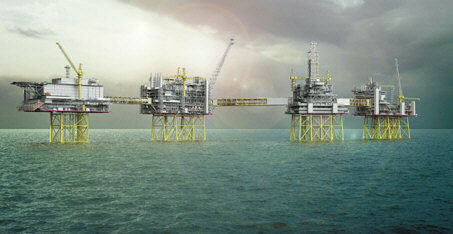 The finished platform will be handed over to Statoil in second-quarter 2018. “The drilling platform is one of four platforms in the planned field center, and it is a complex and challenging project in itself,” commented Margareth Ovrum, Statoil executive vice-president for technology, projects, and drilling. The contract is subject to approval of the plan for development and operation (PDO). The partnership submitted its PDO for Phase 1 this month (OGJ Online, Feb. 13, 2015). In addition to Statoil, the Johan Sverdrup partnership consists of Lundin Petroleum AB, Petoro, Det Norske Oljeselskap ASA, and Maersk Oil. The partnership has recommended Statoil as operator for all phases.